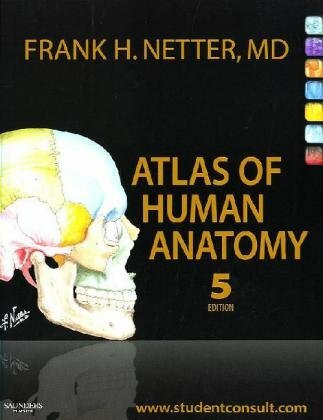 Atlas of Human Anatomy uses Frank H. Netter, MD's detailed illustrations to demystify this often intimidating subject, providing a coherent, lasting visual vocabulary for understanding anatomy and how it applies to medicine. This fifth edition features a stronger clinical focus-with new diagnostic imaging examples--making it easier to correlate anatomy with practice. Student Consult online access includes supplementary learning resources, from additional illustrations to an anatomy dissection guide and more. Netter. It's how you know. Expand your study at Student Consult online, where you'll find a suite of learning aids including selected Netter illustrations, additional clinically focused illustrations and radiologic images, videos from Netter's 3D Interactive Anatomy, dissection modules, an anatomy dissection guide, multiple-choice review questions, "drag-and-drop" exercises, clinical pearls, clinical cases, survival guides, surgical procedures, and more.